I’ve been making smoothies for a while now. Let’s just say Magic Bullets, are, well, the easiest kitchen appliance to use. Why do I love smoothies? They’re simply a quick and easy way to consume all the health benefits foods have to offer while you continue about your day. You can bring it with you when you go out to run errands. Heck, you can even drink it in the shower. You don’t have to stay seated at a table. It’s also great to use up any fruit that is starting to go bad. Purchasing frozen fruit is also a great option, as it is more affordable, obviously lasts longer than your fresh fruit in case you forget about it, and once it’s in your smoothie, you won’t be able to taste the difference between that and fresh fruit. 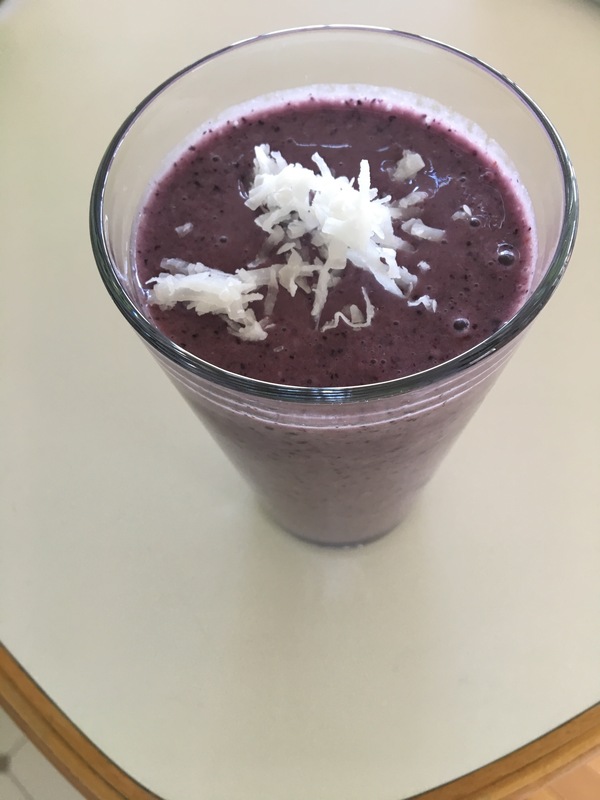 In this Running With Your Heart entry, I’ll go over the basics, my favorite combinations, and some actual smoothie recipes I’ve tried. Ice, because I don’t believe any smoothie will be delicious warm. Maybe it’s a texture vs temperature thing. I wouldn’t recommend trying it without because you’re bound to be disappointed. I always use 3-4 ice cubes and put them in the cup first. Some people will say frozen fruit is a good substitute for ice. I disagree. Sometimes I microwave the frozen fruit a little so that I can taste the flavor more and make blending easier on the Magic Bullet. It’s also just not cold enough without ice. I also add milk (2% or coconut) or juice (cranberry, etc) to help thin out the smoothie. I don’t normally measure but I add this last, probably at least a half cup. If it’s too thick, it’s harder to drink through the straw. I firmly stand on the side that smoothies don’t need yogurt to be a smoothie! (Almost) everyone seems to think so. But, since I don’t eat yogurt by itself, if I want to reap any benefits of yogurt, this is the time I add a couple spoonfuls. That being said, plain (non-flavored) yogurt is best. And store-brand (generic) is A-OK. Greek yogurt is all the rage now. It’s thicker and creamier, contains more protein, less sugar, and generally more fat. In a smoothie, the choice is yours. If your house doesn’t consume yogurt as fast as it goes bad, I find it’s cheaper to buy plain, single-serving cups. And you can always store what you don’t use in Tupperware to keep it fresh. My last couple notes to add before you get started on these smoothie recipes… I find that adding honey or almond butter to a ridiculous healthy-sounding-smoothie-in-the-making is a good way to mask any “dirt” flavors. Although, it’s probably just me that it tastes like “dirt” to. Pineapple chunks are great to add to sharpen up the flavor. And a large bag of frozen blueberries is way more cost-efficient than buying fresh and a little goes a long way. 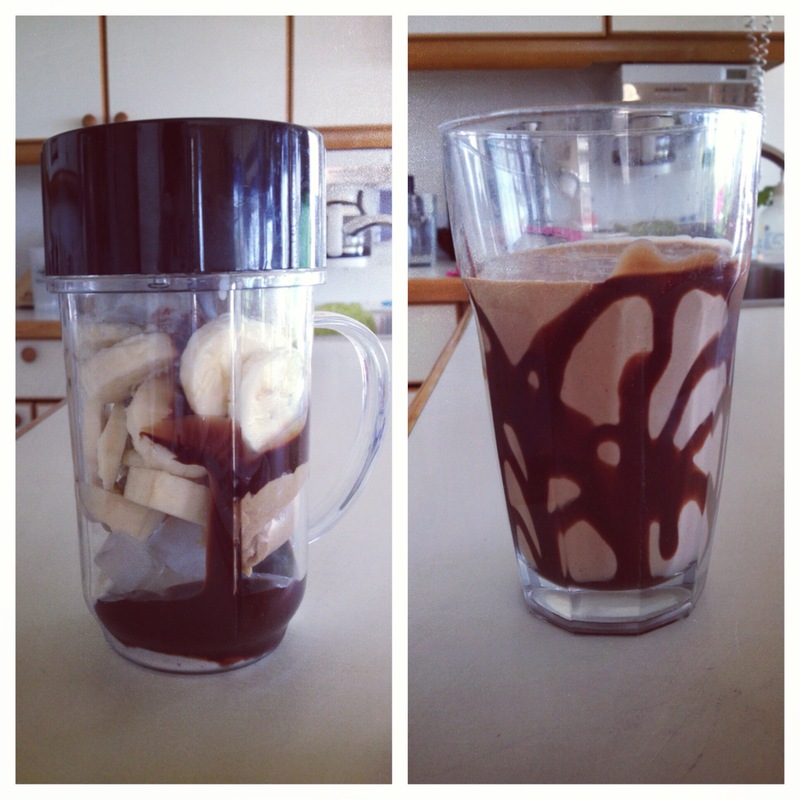 My all-time favorite smoothie is peanut butter chocolate and banana! Ice on the bottom, one chopped banana, a couple spoonfuls of JIF, chocolate syrup, and some milk to help thin it. It’s AMAZING and it’s what got me hooked in 2013! My college used to have a café that would offer chocolate peanut butter smoothies with protein. After I tried that, I would sometimes add protein to my own concoction. It was perfect after a morning run. Or any run, for that matter. My second favorite is strawberry-peach. Ice, four or five strawberries (even frozen ones are ridiculously huge), peach slices (Dole “jarred” or frozen), and a banana for creaminess. If you were to use fresh peach, I recommend peeling the skin, if you might have an issue with texture. 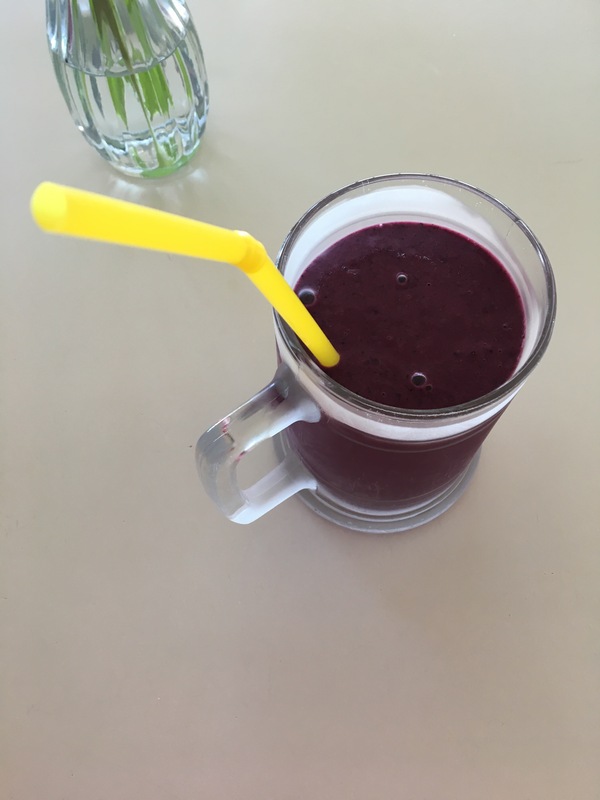 Since all my running cookbooks have smoothie and juice recipes, over the last couple months I’ve decided to actually try some of these recipes. 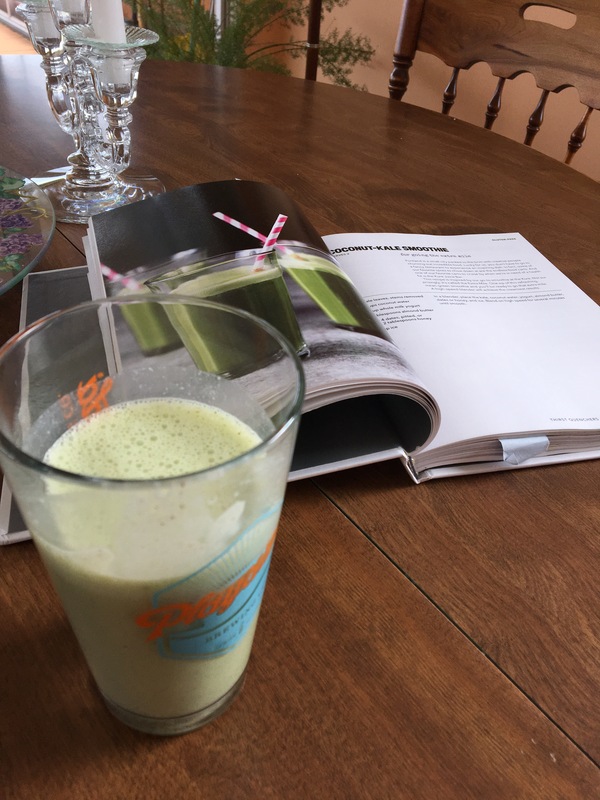 Run Fast Eat Slow has a Coconut-Kale Smoothie. I’m certain I did not add as much kale as I was supposed to since it was a light mint green color and not dark like in the picture; I’m still hesitant. The almond butter and honey really helped with the taste. I added Greek yogurt for creaminess and used coconut milk to thin the mixture, just like the recipe called for. 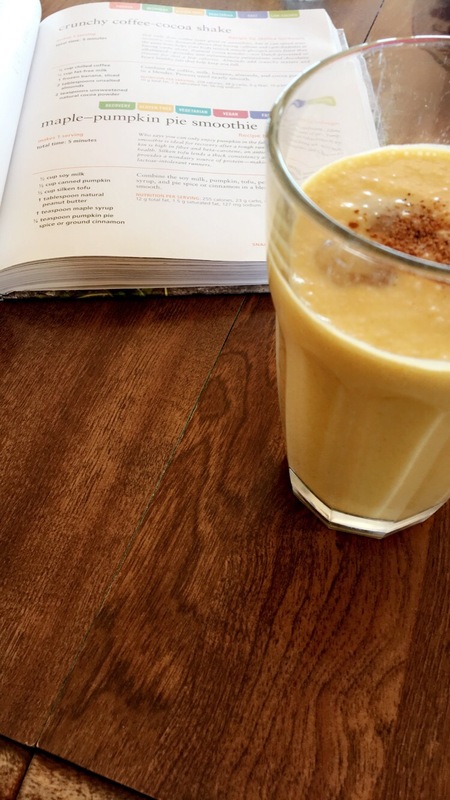 One of my favorites I’ve tried using a recipe was the Maple-Pumpkin Pie Smoothie from the Runner’s World Cookbook. I omitted the tofu it called for, used regular milk instead of soy, but added the canned pumpkin, spoonful of peanut butter, and drizzles of maple syrup. For extra flavor I added dashes of clove, nutmeg, and cinnamon spices. It was a great combination for the pumpkin spice latte lover. 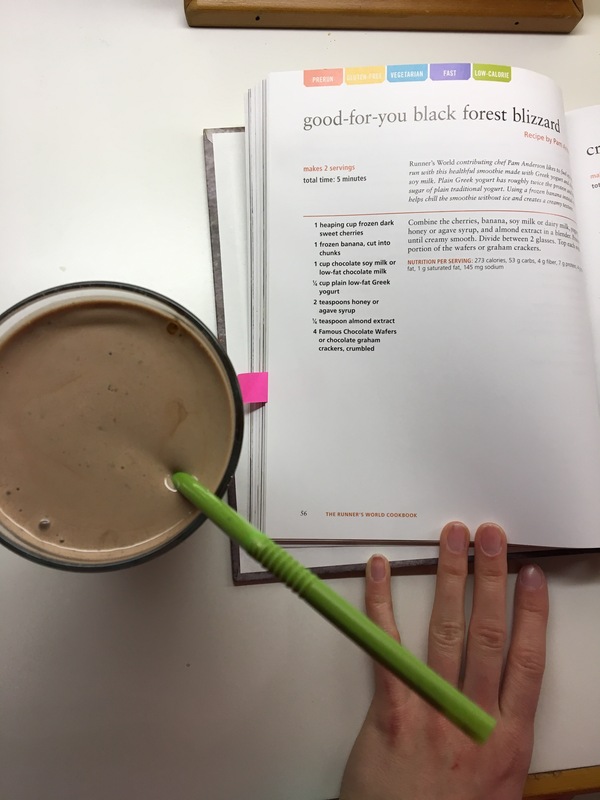 Another successful recipe I tried was the Black Forest Blizzard, also from the Runner’s World Cookbook. I have a soft spot for cherries and chocolate so this was expected to be an excellent combination. Frozen cherries, a ripe banana, regular milk, chocolate syrup, and a little bit of honey and Greek yogurt yielded a refreshing and smooth drink. I didn’t quite follow Runner’s World Meals on the Run Power Breakfast Smoothie recipe. I added all but the quick-cooking oats: yogurt, blueberries, shredded coconut, almond butter, honey, banana, and mango. I was unsure what kind of texture the shredded coconut would give but it wasn’t the worse it could be (after trying miscellaneous recipes with unpeeled apples). Lastly, I tried Run Fast Eat Slow’s Can’t Beet Me Smoothie. I’m still hesitant about beets but I pre-cooked them the day before. I was a little weary of the blueberry, banana, coconut milk, beet, and almond butter combination. However, it was not that bad! If it was bad, I’d tell ya! I think it was better than the Coconut-Kale Smoothie! I didn’t have ginger to add that the recipe called for but I bet it would have helped. I think you’re ready to try making your own smoothies! What are your favorite combinations?